I made a number of jewelry pieces with the mokume gane created in my last tutorial video. As I cut and shaped I noticed that I really liked some of the patterns that showed up. But their appearance seemed rather random. So in this video I set out to experiment with the effects of layer thickness and tool size and proximity. The purpose of this video was to get a better understanding of how different preparation aspects impact the final mokume gane pattern. This will allow me to purposely reproduce what I like and minimize waste of potentially beautiful patterns. Thank you Rhonda. 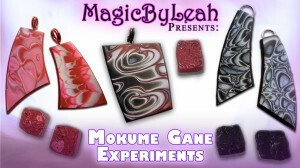 Have you tried Mokume Gane yet? Thank you Leah. That was so interesting and informative. I am off to try this today! I just can control myself to make all these things,but the materials required are not available near my place.Its like most of these sellers dont know what all this means,so basically i am not able to make these. But yeah,your art skills are really good! Are you able to shop online and get international shipping Kavin?